The Acting Chairman of the Economic and Financial Crimes Commission (EFCC), Mr Ibrahim Magu, has warned officials of the agency to shun underhand dealings that can put the commission in a bad light. He gave the warning on Monday at the EFCC Zonal office in Enugu State, where he urged the officials to see their work as a call from God to serve humanity. “You cannot be fighting corruption and be corrupt,” Magu said in a statement by the EFCC spokesperson, Wilson Uwujaren. “You must be committed to your work and not mind the temptations because we will not spare anyone who is corrupt,” he said. The EFCC boss also advised them to always seek to learn from their superiors, saying nobody is a repository of knowledge. Earlier before addressing staff members at the zonal office, he paid a courtesy visit to the Chief Judge of Enugu State, Justice Ngozi Emehelu. 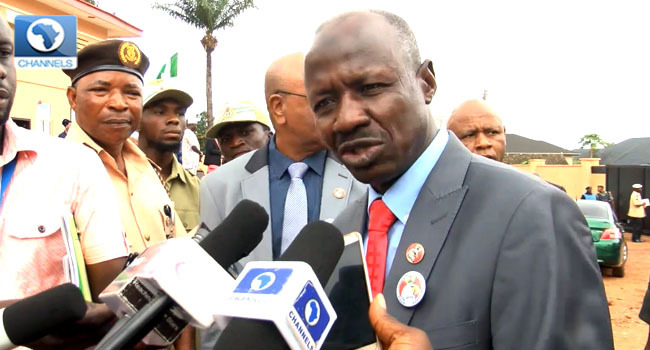 Magu noted that the EFCC remains committed to learning and being guided by judicial prefects to carry out its functions of ridding Nigeria of corruption. The EFCC boss stressed further that the judiciary was instrumental to the achievement of the anti-graft agency, adding that its support would be highly needed for continued success. He also called on Nigerians across the country to do the needful and join forces with the commission to move the nation forward positively. In her response, Justice Emehelu lauded the visit of the EFCC boss whom she described as a formidable and hardworking man. She also assured him that the judiciary was poised to support the anti-graft agency in its efforts at eradicating corruption from the country. Citing the judiciary as the balance between the legislature and executive, the Chief Judge said the need for a speedy trial of criminal cases cannot be over-emphasised, and that the judiciary was committed to effective justice delivery and speedy determination of cases.